Our mobile juice container can simply be dropped at the desired location and exchanged for another WAB (Exchange Platform Bridge). Thanks to this flexible assembly, the truck is not blocked and can safely drive away. The independent lowering of the working height and alignment ensures a safe and stable position of the container. By folding down the four support legs, the truck can be lowered through venting of the bellows and can then be driven out from underneath the structure. Economical, flexible and unique – these features speak for our assembly. Ready to use on site, you only require a water- and electrical connection. Entirely made of stainless steel and aluminium and equipped with a high-pressure cleaner and compressor, this assembly is always usable, regardless of weather conditions. With our bin tippers your bins can be emptied into the washer system without any effort – an easy and efficient solution. 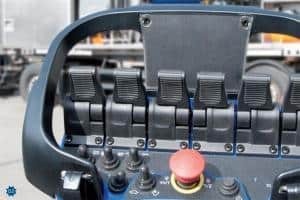 The tipper is made completely of stainless steel, and through simple operation by means of a foot pedal the bin is easy to control. Your delivered bins can therefore be dosed and gently emptied into the washer system. Inside the washing container the fruit undergoes an intensive cleaning. The integrated pump produces a recirculation of water, which achieves a gentle and effective cleaning. Afterwards the cleaned fruit is passed on directly, without any physical effort. 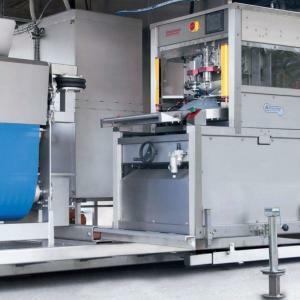 A food safe plastic conveyor belt with continuous speed setting transports the fruits upwards, where it gets cleaned again by water spray jets and is transferred into the directly attached crushing system. 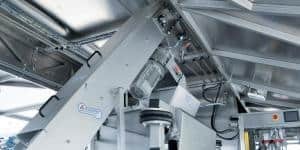 A highly efficient crushing system prepares the mash for a quick and simple pressing in a sophisticated process. After the fruit is crushed in the crushing machine, the mash is passed towards the dosing box. There it is spread evenly on the sieve belt and finally removed with a scraper. The special cylinder profile and the belt guide ensure rotating pressure- and shearing pressure. This provides a fast and efficient straining of the product, as well as a high juice yield. In order to adapt the machine to the different working conditions (fruit- and vegetable types), the belt speed and the crushing pressure can be changed by the user as needed. The assembly can be made with different hourly performance settings as desired, in order to accommodate individual production requirements. 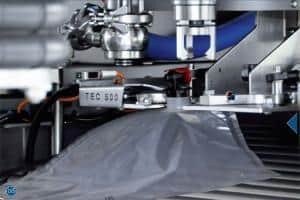 The buffer tanks are used for storing the strained juice and after the pasteurization as a buffer between the filling station, for a hygienic temporary storage to balance different capacities. This ensures a consistantly high product quality and independent crushing and pasteurization process as well as a steady and flexible working process. The juice stored in the stainless steel tank is now transferred to the pasteurizing assembly. Here the product is pasteurized through a short and gentle (vitamin conserving) heating to about 80°C in a heat exchanger. 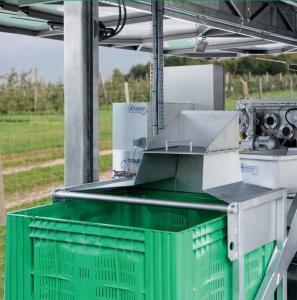 The pasteurizer assembly automatically takes the amounts of juice from the buffer tank. These are then filled into the BAG-in-BOX pouches while still hot. The filling station is extractable on heavy duty rails, and is fixed with a support leg. This provides more room for the filling of juices. Thanks to the stainless steel execution and the rain cover, it is ready to use in any weather. After a bag is placed in the locking device and the tap has been removed, the filling station is swung over the top of the bag and the start button is be pushed. The set amount is pushed into the bag with the filling pump. After the set amount of juice is reached, the flow meter shuts off the filling valve and closes it. Due to the special construction of the filling valve, you achieve a very high accuracy level and prevent a delay yield.